In my day-to-day work as a Michigan driver’s license restoration lawyer and a Michigan DUI attorney, I deal with the whole panorama of problems that arise for the use of an ignition interlock unit, from false positive test results to the utter lack of any real “tech support” or help from the vendors. In fact, it’s hard to use the term “ignition interlock” and not use the word “problems” in the same sentence. While the technology has come a long way over the last number of years, it’s still fraught with innumerable problems. In truth, it’s far more a matter of luck, rather than anything else, if and when someone drives a year or more driving with one of these units and things go smoothly. A few days before this article was written, I attended an ignition interlock seminar put on by one of the vendors of these units. I learned a number of things, but chief amongst them, and somewhat to my dismay, is that I happen to know a lot more about these units than most of my colleagues. It’s not that I’m any smarter than anyone else, but rather that I have loads of experience with these devices as part of my Michigan driver’s license restoration practice. Unfortunately, or perhaps fortunately for the reader dealing with an interlock nightmare, virtually all of my considerable interlock experience is the result of problems caused by these units. It’s likely that if you’re reading this, you’ve run into some problem with yours, or are looking for someone that has. Rather than laundry list what can go wrong with these units, I think that a few significant points from my recent seminar are relevant here. First, although the particular vendor hosting the seminar did a good job of showing how much these devices have been improved as a result of new and evolving technology, it had to be admitted that they are machines, and, as a result, they do, admittedly, malfunction. Second, and perhaps most significant, there is really nobody who works with these units who has any comprehensive knowledge about them. That’s not to say that there aren’t engineers and other technical people at the design and manufacturing level who don’t know what they’re doing. In the field, however, in terms of lawyers, Judges, probation officers, Michigan Secretary of State Driver Assessment and Appeal Division (DAAD) hearing officers, and even service technicians, it seems that there is a decided lack of understanding about ignition interlock units, how they work, and how often they can be wrong, as well as why they can appear to be functioning normally and produce inaccurate results. I left the seminar feeling like more of an expert than anyone there because I have a thorough knowledge of the legal situations in which ignition interlock units are used, the evidentiary standards that these units are supposed to meet, both in court and before the Secretary of State, meaning the DAAD, the standards of reliability that are (often incorrectly) attributed to them, and the practical and technical considerations that govern how they work in the real world. The big problem, in just about any situation where an ignition interlock is being used, is that a positive test result is just that; a positive test result. Unlike a DUI charge, where a difference of .01 can be the difference between a more or less severe drunk driving charge, or even no charge at all, in the landscape of ignition interlock units, that kind of math doesn’t work. In fact, I’ve been hired in probation violation cases where a person has been violated for testing positive with a .01 reading. In that case, and, increasingly, Judges are ordering probationers to drive with an ignition interlock unit and using the unit as a compliance testing method, as well, so that even on a Sunday, if Denise the driver doesn’t have to go anywhere, she’ll be ordered to go out to her car, start it up, and provide a breath sample. To be fair, there is a protocol that should be followed if a person tests positive for alcohol and has not been drinking. Every manufacturer advises that, if that occurs, you should rinse your mouth out with water and then wait a certain time period (usually 3 to 5 minutes, but this can vary by manufacturer) before providing another breath sample. Barring a serious malfunction of the machine, that usually fixes things. IF it doesn’t, the very best thing you can do (and about the only thing you can do) is go to the nearest police station and take a PBT test. Given the consequences of not following up, getting to a police station should be done no matter how inconvenient or expensive it is to get there. In the real world, the Secretary of State DAAD hearing officers have a better understanding of interlock units because they have to deal with positive and false positive test results multiple times every day. Certainly, that understanding is enlarging with time and experience, but that makes it critical, if your facing an interlock violation, to hire a lawyer with at least an equal, if not better working knowledge of these units than the hearing officer who will decide your case. As much as they deal with these issues, for most hearing officers, “dealing” with them is confined to reading the logs showing a positive, or high-positive test result. It would be polite to the point of being disingenuous if I didn’t remind the reader that, no matter how truly compliant he or she has been, from the DAAD’s point of view, a healthy dose of skepticism is the order of the day. Anyone dealing with the DAAD has certainly had problems with drinking. As the reader likely knows, the DAAD sets the bar rather high before it gives back any driving privileges, and it must monitor a person for at least the first year on an ignition interlock to make sure that he or she does not drink. Once the interlock vendor notifies the Secretary of State of an interlock violation, the SOS yanks the person’s license before it even asks any questions. In a very real way, and many lawyers might be too timid to put it this bluntly, but the DAAD is concerned that a person is back up to old tricks again. In other words, whatever the reasons for a violation, there is no “benefit of the doubt.” You have to come in and convince the hearing officer that the interlock got it wrong. All the hearing officer has is a record of drinking and driving, a promise to never do that again, and then a violation report from the interlock company. At that point, things don’t look too good. This is a situation that needs to be fixed. I can certainly help. In the context of a DUI case, or other matter pending in a court, and not before the DAAD, my job often requires, to at least some extent, that I teach the Judge a bit about breath testing technology. Most people don’t have a clue how an interlock works. After all, the end product is a test result that, at least in theory, shows your BAC, or “bodily alcohol content.” Yet for all of that, the machine is supposed to collect the alcohol from the moisture droplets expelled as you breathe. This is why these machines can “go crazy” if a person uses windshield wiper fluid before he or she tests, or uses hand sanitizer, or any of many other things that can trigger a false positive. 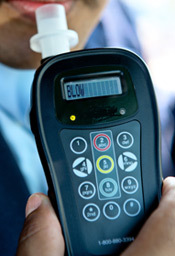 Beyond educating the Judge, it is imperative to put yourself in his or her shoes: A person with a record of drinking and driving has provided a positive breath test sample. Before getting all red in the face and proclaiming your innocence, you must remember that for most people using an ignition interlock, there are no problems with the machine. Think of it this way: Most of us leave a voicemail message to someone or other regularly. If you call someone you know, and leave a voicemail and hit the prompts and hear “Your message has been sent,” you figure everything worked as it should, right? If you don’t hear back from the person, and then, when you ask him or her about it later, and that person says that they didn’t get your voicemail, isn’t there a part of you that questions that statement? We all know that things can happen, but our experience teaches us that, by and large, voicemail works like it’s supposed to. Sometimes, if a person, upon getting a false positive, calls me quickly enough, I direct them to obtain an alternate kind of urine test that will test for several days’ before the breath test was given. Other times, we just have to work up a circumstantial case. In some cases, a person may have had a slip and taken a drink. Even in that situation, putting that “slip” in the proper context for the Judge is critical. This, again, is where I can help. Whatever else, if you experience problems with an ignition interlock unit, you must be proactive, and properly reactive. You cannot just wait and see what happens, or “go with the flow.” Unfortunately, in these cases, the “flow” will take you right down the drain. Normally, I charge a flat $1500 fee in all interlock violation cases. I don’t make my fees some mystery about which you have to call or come in for an appointment. Frankly, it makes me wonder that if someone can’t be up front about what they charge for something, how candid will they be about everything else?